Anemia is a common feature of CKD associated with poor outcomes. The current management of patients with anemia in CKD is controversial, with recent clinical trials demonstrating increased morbidity and mortality related to erythropoiesis stimulating agents. Here, we examine recent insights into the molecular mechanisms underlying anemia of CKD. These insights hold promise for the development of new diagnostic tests and therapies that directly target the pathophysiologic processes underlying this form of anemia. Why would ESAs have these adverse effects? Although relative EPO deficiency may contribute to the anemia of CKD,23 it is not the sole cause. Indeed, anemia of CKD is resistant to ESAs in approximately 10%–20% of patients.2 It seems likely that supraphysiologic doses of ESAs, especially at very high doses or in patients resistant to treatment, have off-target effects in other tissues. These findings have renewed interest in understanding the molecular mechanisms of anemia in CKD, with the hope of developing new therapies that more closely target the underlying pathophysiology of low hemoglobin. Aside from EPO deficiency, what else contributes to the anemia of CKD? Numerous studies suggest that circulating uremic-induced inhibitors of erythropoiesis contribute to the anemia, although this has been disputed in some studies and no specific inhibitors have been identified.13,23 Shortened red blood cell survival also contributes, as demonstrated by radioisotope labeling studies.23–25 Although the etiology is not entirely clear, metabolic and mechanical factors have been proposed.23,24 Nutritional deficiencies, such as folate and vitamin B12, due to anorexia or dialysate losses are currently uncommon with the routine use of supplementation in hemodialysis patients.23 Whereas hemodialysis patients historically developed secondary iron overload from recurrent blood transfusions, the modern era of ESA treatment has uncovered an increasingly recognized role for disordered iron homeostasis as a major contributor to the anemia of CKD. Recent data suggest that hepcidin excess may account for the impaired dietary iron absorption and reticuloendothelial cell iron blockade present in many CKD patients. Discovered independently by three groups in 2000–2001,30–32 hepcidin is the main hormone responsible for maintaining systemic iron homeostasis.26 Produced by the liver and secreted into circulation,30–32 hepcidin binds and induces degradation of the iron exporter, ferroportin, on duodenal enterocytes, reticuloendothelial macrophages, and hepatocytes to inhibit iron entry into the plasma.33 Inflammatory cytokines directly induce hepcidin transcription,26 presumably as a mechanism to sequester iron from invading pathogens, leading to the iron sequestration, hypoferremia, and anemia that are hallmarks of many chronic diseases including CKD. Recognition of a key role for hepcidin excess in causing the functional iron deficiency and anemia of CKD has ignited interest in targeting the hepcidin-ferroportin axis as a new treatment strategy for this disease. By blocking hepcidin and/or increasing ferroportin activity, these agents could improve dietary iron absorption and iron mobilization from the patients’ own body stores, thereby minimizing the need for supraphysiologic doses of intravenous iron and ESAs with their potential adverse effects. Importantly, in CKD patients with hepcidin excess, large intravenous boluses of iron would be predicted to have limited effectiveness because much of the iron is rapidly taken up by the liver and sequestered, and the remainder that is incorporated into red blood cells would be recycled ineffectively. In addition, intravenous iron itself would further increase in hepcidin levels35 and worsen this phenomenon. Several strategies under investigation include antagonizing hepcidin directly, inhibiting hepcidin production, interfering with the hepcidin/ferroportin interaction, or stabilizing ferroportin.38–41 Initial small studies suggest that targeting this pathway can increase iron mobilization and hemoglobin in animal models of anemia of chronic disease.39–41 The side effect profiles and whether these strategies will prove effective for treating anemia of CKD in humans remain unknown. In summary, anemia of CKD is a multifactorial process due to relative EPO deficiency, uremic-induced inhibitors of erythropoiesis, shortened erythrocyte survival, and disordered iron homeostasis. Recent work has identified hepcidin excess as a main contributor to the disordered iron homeostasis and anemia of CKD by impairing dietary iron absorption and iron mobilization from body stores (Figure 1). Improving our understanding of the molecular mechanisms underlying anemia of CKD holds promise for developing new pharmacologic agents that more closely target the underlying pathogenic mechanisms of this disease for improved efficacy and reduced treatment-related adverse outcomes. Schematic representation of the mechanisms underlying anemia of CKD. 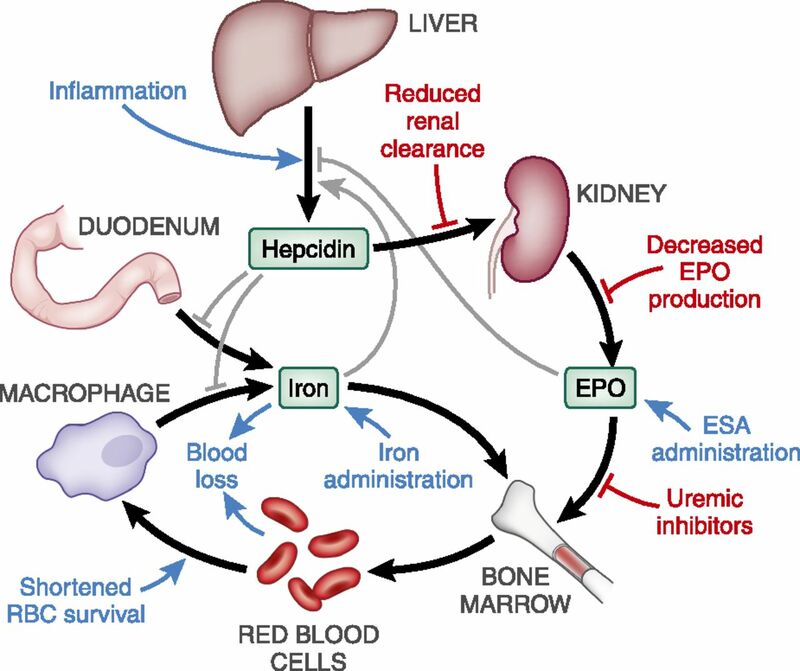 Iron and EPO are crucial for red blood cell production in the bone marrow. Iron availability is controlled by the liver hormone hepcidin, which regulates dietary iron absorption and macrophage iron recycling from senescent red blood cells. There are several feedback loops that control hepcidin levels, including iron and EPO. In CKD patients (particularly in end stage kidney disease patients on hemodialysis), hepcidin levels have been found to be highly elevated, presumably due to reduced renal clearance and induction by inflammation, leading to iron-restricted erythropoiesis. CKD also inhibits EPO production by the kidney, and may also lead to circulating uremic-induced inhibitors of erythropoiesis, shortened red blood cell lifespan, and increased blood loss. Black and gray arrows represent normal physiology (black for iron and hormonal fluxes, gray for regulatory processes). Colored arrows represent the additional effects of CKD (blue for activation, red for inhibition). RBC, red blood cell. J.L.B. and H.Y.L. have ownership interest in a startup company, Ferrumax Pharmaceuticals Inc., which has licensed technology from the Massachusetts General Hospital based on work cited here and described in prior publications. J.L.B. is supported in part by National Institutes of Health Grants RO1 DK087727 and K08 DK-075846 and a Claflin Distinguished Scholar Award from the Massachusetts General Hospital. H.Y.L. is supported in part by National Institutes of Health Grants RO1 DK-069533 and RO1 DK-071837.